This 10,000-watt generator from Porter-Cable features a Honda GX620 commercial engine for heavy-duty use and will supply 12,500 surge watts. Features like overhead valves, cast-iron sleeves, and low-oil shutdown make this engine durable and smoother running. An advanced, brushless alternator design provides longer life, cleaner power, and eliminates brush replacement. The electric start allows effortless starting. A 12-volt battery is also included. 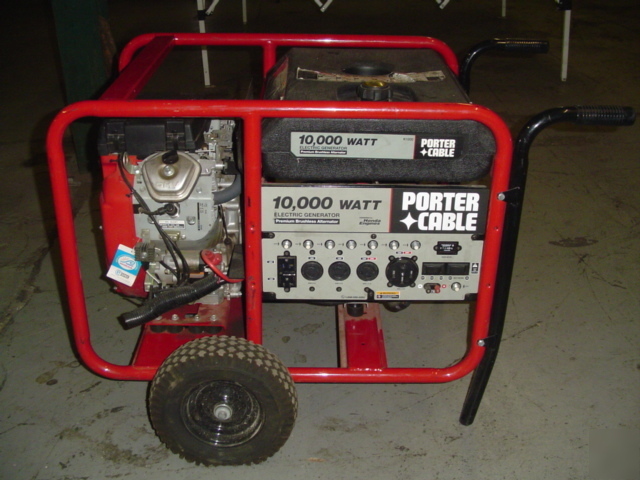 An idle control automatically slows the engine speed down when current is not being drawn from the generator, saving gas and extending run time. The convenient console panel houses the switches as well as an hour meter, circuit breakers, and electrical outlets. Outlets include 12-volt DC, 120-volt AC duplex, a 120-volt AC twist lock and 120/240-volt twist lock, and a 240-volt high-power outlet to support a variety of tools and equipment. The 7-gallon tank provides 8.1 hours of run time at half load and 4.2 hours at full load. The included handle set and 13-inch pneumatic tires allow for easy rollaway portability. * Honda 20 HP commercial twin cylinder engine with: overhead valves, cast iron sleeves, low oil protection, pressure lubrication, and spin-on filter. If you have any questions feel free to e-mail us. Visit our store for other great products. Thanks for your interest! !